Mars was a poisoned promise. High on the optimism of prospectors, colonists flocked to the Red Planet, only to meet the same fate as American forty-niners or Australian immigrants who bet on a brief mining boom last century. 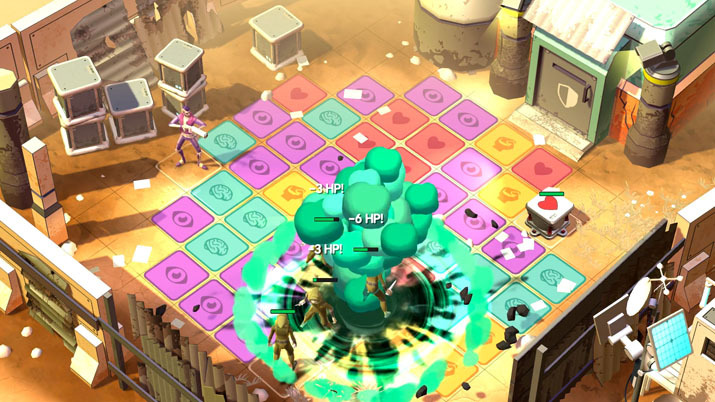 Turns out the grass isn't greener on these red sands, and now you can't afford to go home — but that's just the backdrop for Ticket to Earth, a blend of puzzle-RPG and turn-based tactics which just released its first episode: Uprising. Indie studio Robot Circus calls Melbourne, Australia home, and consists of your usual AAA, industry professionals turned A-Team after leaving their positions at a large studio. They call Ticket To Earth “the kind of game we formed our studio to make.”  Whoever their Hannibal is, I can attest that, so far, their plan's really coming together into a polished and promising experience. Episode 1 lasts five-to-six hours. Robot Circus plans three more episodes of the same length, which sets a pace for about twenty hours of content, once the series is complete. If you buy this first episode, you get the three future episodes as free updates. To be absolutely clear: “Ticket to Earth is a gripping RPG narrative delivered over four big episodes. By purchasing Ticket to Earth, you’ll have access to every episode as they release, automatically added to your game and at no additional cost”  – the developers aren't pulling a DLC gimmick. I want us to take a moment and appreciate that. Yes, the day has finally come; Robot Circus has arrived to restore our faith in this industry and perhaps even in humanity itself. It's an ordinary day, until two things happen. You play as Rose, an ordinary colonist of New Providence who tends the town garden, pruning it with an old practice blade from a martial arts school of her youth. It's an ordinary day, until two things happen. One, mutant bugs break into the garden, as though suddenly there's no security keeping them out of town. Two, Rose gets a call from her girlfriend, Xen, who's watching the news in her apartment across town. It seems there's unrest, and the news was hacked by an Anonymous-like group proclaiming this to be “Zero Day.” Without further warning, violence breaks out in town, and Rose's quiet life shatters under the force of revolution. Rose cuts down the bugs that invade her garden, followed by more serious threats. The longer the chain of tiles she runs on, the more damage her next attack deals. She picks up these colored tiles as she steps on them, charging abilities which can inflict extra damage, alter the battlefield, and disable enemies. You eventually gain access to a ranged ally, but you spend most of your time with Rose, a likable hero of circumstance who'd be fun to follow, even if she hadn't needed to step up and act the part of that hero. She shows real emotional life, a relatable level of empathy for her citizens in crisis, without crossing over into the territory of avenger or bleeding heart. She's tough, clever, and practical, even though her girlfriend thinks the spiritual side of ye olde martial arts training Rose had is a bit hokey. Xen herself makes an engaging character; her computer expertise plays a complementary role in the plot alongside Rose's combat missions, since masterminds of the Zero Day uprising rely heavily on cybercrime. Count me completely on board with the writing and aesthetics of Ticket to Earth. I also love the gameplay style, since, for the most part, combat feels dynamic and intuitive. However, the randomization of tiles on the board occasionally creates imbalanced situations. I find that, across replays of every mission, the starting setup of the board drastically changes the encounter's difficulty. Without even a limited means of choosing Rose's position on this random board, you can waste your first turn collecting minimal resource tiles while getting beat on by enemies who rack up huge combos. Restarting a fight carries no penalty, but if you're a stubborn, permadeath, ironman-style player like me (rookie take point), the disparity between attempts will frustrate you. At least in X-COM, if you position a unit badly and lose, it's your fault; you exercise no control over the conditions of your first turn and your first move, but these are precisely what turn the stage into a quick cinch or a drawn-out disaster. As smooth and fun as running around and delivering maximally charged attacks with Rose can feel, there's no middle ground. You're either dealing maximum damage, or none, because of the tile layout you received. Casual players won't notice, but the rest of us must reconcile and pick around one crunchy mutant beetle in our otherwise snappy, smooth space ice-cream. 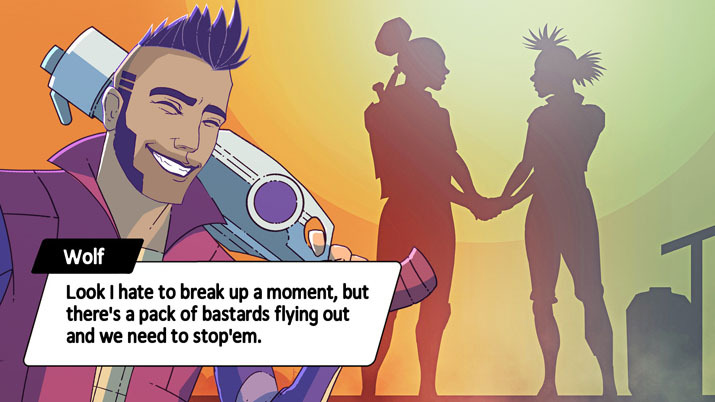 Ticket to Earth combines puzzle gameplay with turn-based strategy to create a smooth and dynamic RPG experience. Natural dialogue and engaging characterization pair with a direct, clean plot in an emotionally honest portrayal of individuals caught up in social upheaval. The randomization of tiles on the battlefield leads to uneven difficulty, but intuitive controls make for smooth combat. While the product as it stands only delivers one out of four projected episodes, additional episodes will arrive as free updates rather than paid add-ons or DLC. While I have reservations about rating an incomplete title highly, I have no doubt future episodes will maintain the same quality of experience.